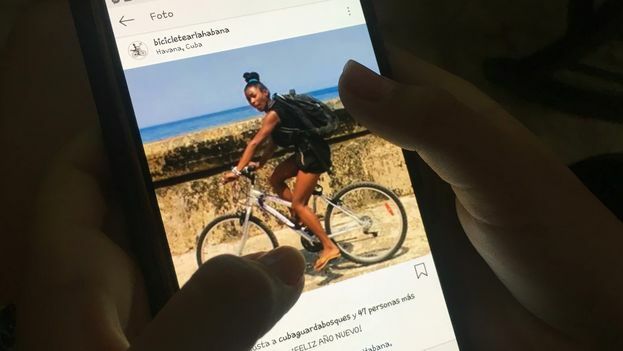 14ymedio, Luz Escobar, Havana, 6 January 2019 — A month into Cubans’ ability to connect to the internet from their cellphones, users are complaining of the high prices of the service and the shortcomings of the 3G but, at the same time, many appreciate the advantage of being able to connect from anywhere. On December 6 the Telecommunications Company of Cuba enabled web browsing on cellphones. However, a considerable number did not get the capacity because of the incompatibility of their devices, lack of 3G coverage, or the high cost of the packages. Yordanys Labrada, resident of Songo La Maya, is one of those to whom the technology dealt a raw deal. With a very modern phone, made in 2018, this young Santiago native laments that the device cannot connect at the frequency of 900 Mhz, that chosen by Etecsa for sending and receiving web data. “My phone works in 2, 3, and 4G, but with the problem of the frequency I can’t do anything,” he explains to 14ymedio. Now, to connect, Labrada has to keep visiting the wifi zones that began to be installed in plazas and parks all over the Island beginning in 2015. One of the most evident signs that internet has come to mobile phones is, precisely, the lack of crowding in these areas, traditionally full of customers wanting to check the worldwide web. On La Rampa in Havana the number of internet users has decreased in the past month. “Even though it can be a lot more expensive connecting on mobile versus on wifi, people really value being able to do it in the peace and privacy of their home,” believes Jean Carlos, a young man of 21 who says that since the beginning of the service for cellphones he has used two packages of 2.5 gigabytes, for a total of 40 CUC, the equivalent of an engineer’s monthly salary. Browsing on cellphones is sold through data packages and its price goes from 7 CUC for 600 megabytes up to 30 CUC for 4 gigabytes. Jean Carlos can afford those expenses because he works as a ’mule’ bringing merchandise to the Island. “Via email and WhatsApp buyers tell me what they want me to bring them.” His informal business depends on being connected the majority of the time. For Lorena Rodríguez the view is very different. The high school student describes the price as “still very expensive” and she became sad when the first package of 1GB that she purchased ran out in two days in which she only used Imo, Facebook, Instagram, and WhatsApp. Something similar happens on Calle 14 near the centrally located Avenida 23, in Havana, where the residents insist they are in a “zone of silence.” Some of them have commented ironically on social media about the nearness of the cemetery and the “dead spot” of connectivity in which they live. Other criticisms arise from the ineffectiveness of the additional voucher for 300 megabytes which allows users to browse only on domestic sites, and comes with the purchase of any package. Technical difficulties and little interest in visiting these websites, all in the hands of the government, mean that the option has not had a great popularity according to what this newspaper was able to confirm after investigating among numerous customers. “I’m still using the principal data package even when I visit a .cu website,” complained a reader of the official newspaper Granma. The response he received from Etecsa officials boils down to the fact that, even though Cuban pages are housed on domestic servers, they have elements or modules inserted that come from foreign services. “The majority of the people I know don’t use this service to visit any domestic website, but rather to interact on social media and look up information from other independent or foreign media,” 14ymedio is told by a young man who has found a business gold mine in configuring Access Point Names (APN) in mobile phones. “The customers who come also want me to set up their Facebook accounts, help them understand how messaging or chat services work, or install some application to control data use,” says the computer specialist, who has a small mobile phone repair place on Calle San Lázaro in Havana. In the first week Etecsa recorded “up to 145,000 simultaneous data connections from the mobile network.” Although there have not been new updates of those figures, on social media a larger volume of posts coming from the Island is noted, as well as a greater immediacy in response or interaction times. In the last three weeks almost all of the ministers and members of the Council of State have opened Twitter accounts after the head of the Government did so. But the officials still seem awkward on social media and merely repeat slogans or retweet news from official media. The arrival of internet service has coincided with a worsening in shortages of basic products, like flour and eggs. From their cellphones internet users have discovered that they could denounce the absence or poor quality of rationed bread and show the empty shelves in stores. The referendum on the new Constitution, on February 24, is also material for the Net. The government has determinedly thrown itself into promoting the vote for “Yes” on all its digital sites and on the social media accounts of its officials. The supporters of the “No” vote and of abstention have done likewise, lacking access to mass media within the Island. The ideological battle experiences moments of commotion on the internet and connections from mobile phones seem to have contributed to heating up the debate.